Buy Direct from the Harness Inventor on this website!!! The Freedom No Pull Harness features a luxurious soft velvet lined girth strap for your dog's comfort. 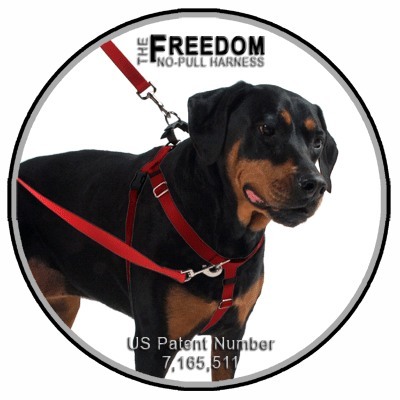 The Freedom No Pull Harness was Designed & Patented by Jessica MacDonald, co-owner of this website and USA Dog Shop. The Freedom No Pull Harness is endorsed worldwide by Trainers, Vets, Adoption Groups, and seen on the hit training show It's Me or the Dog on Animal Planet. 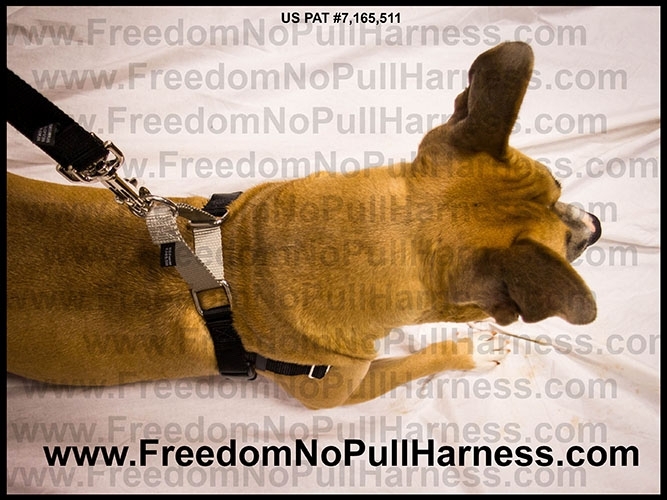 The unique patented harness design minimizes/eliminates pulling, neck strain, and the chance of escape. All Freedom harness feature a soft velvet lined girth strap located behind the front legs. The harness is extremely effective for training and minimizes the effect of pulling for several reasons: (1) tightening effect of the loop on the harness, (2) the location of the loop, (3) the reconfigurable design that allows you to attach to only the back or to the front and back of the harness simultaneously. MEASURE the circumference of your dog's chest by placing the tape measure all the way around the chest (rib cage), behind the front legs. The tape measure should be flat to the dog, not pulled tight, but not loose. If you do not have a soft tape measure used for sewing, you can use a leash or a string and measure that instead. If you dog is an adult, a good weight and not expected to gain or loose weight you can use the following GUIDELINES: The Measurement is MOST important when selecting the size. The weight is an approximate guideline. Custom Sizing is available if your dog is large than 43". For puppies or growing dogs, give us a call so we can help select a size. Coupon: ThankYou (all one word). Save 10% on orders over $28.99 or more. Enter the coupon under Trainer/Adoption Group Code. 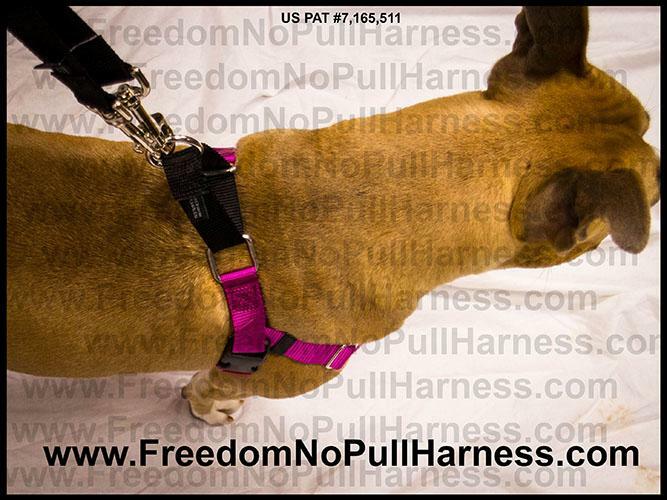 The patented tensioning loop located behind the dog's neck on the FREEDOM No Pull Harness is designed to gently tighten around the dog's chest as the dog pulls. The loop is the key to the training and communication between the human and the dog. The harness does not work from creating pain instead the harness works with the dog in a very natural manner. As the dog pulls the harness tightens around the structure of the dog. When the dog stops pulling the harness provides immediate positive feedback by releasing the slight tension. The loop on the harness will not hurt or injure the dog as it has a limitation on how much it can tighten. The location of the loop is also important. The loop was designed and placed at the base or scruff of the dog's neck as this is the dog's center of gravity. This is why a mother dog picks up her pups from the scruff. It is easier to control from the center of gravity rather than an extremity like the neck. You can literally lift your dog up by the loop of the harness without hurting them. This situation is not possible with a neck collar. When the dog is pulling forward the harness lifts the dog slightly off of their feet minimizing their over all strength and power and allowing you to gain more control. The gentle hugging around the structure of the dog's body has been found to be beneficial with dogs suffering from anxiety and/or agression issues. This is the same reason why compression jackets help ease anxiety. Should you desire to both redirect your dog as well as provide training from the back loop, you can purchase the two point connection leash. This leash allows you to connect to the front and back of the harness simultaneously. In the front and back configuration you are controlling the entire structure of the dog instead of a single point, thus maximizing control. The harness is designed so that the front straps are located below the neck area minimizing the possibility of many common neck, trachea, spinal cord and optical injuries associated with pulling/tugging on a collar. 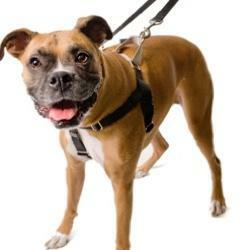 Additionally, the harness is found to be helpful assisting dogs with amputations or arthritis. Why Does the Harness Work? Most harnesses allow a dog to pull harder because they distribute the pressure. The Freedom No Pull Harness is different because the loop located on the back gently tightens as the dog pulls. The slight pressure allows you to control the dog easier while simultaneously giving the dog a physical cue. The tightening is only slight so it does not cause injury to the tendons or back. Connect both clips to just the back of the harness. This configuration creates a 3' long leash. Extend the leash by sliding the webbing handle all the way to one end. Clip one end of the leash to the harness and the other end to the "o" ring at the leash handle. This configuration makes a 5' lead. Connect one clip to the front of the harness and one clip to the back of the harness. This configuration allows you to work with the dog from multiple points. Connect one clip to the back of the harness and one clip to the collar. This configuration allows you to work with the dog from multiple points. This configuration is intended to help people move away from using the collar to using only the harness. You may also purchase the 10-way configuration Freedom Lead, sold above or the training leads page. This leash has 10 different types of functionality rather than just (4). Please note the 4-Way configuration Training Leash will be shipped in the width and color that matches the harness you ordered unless you order the leash separately on the leash section of the website. For example, if you order a black 1" wide harness with a silver loop, the leash will be 1" wide, black with a silver handle. 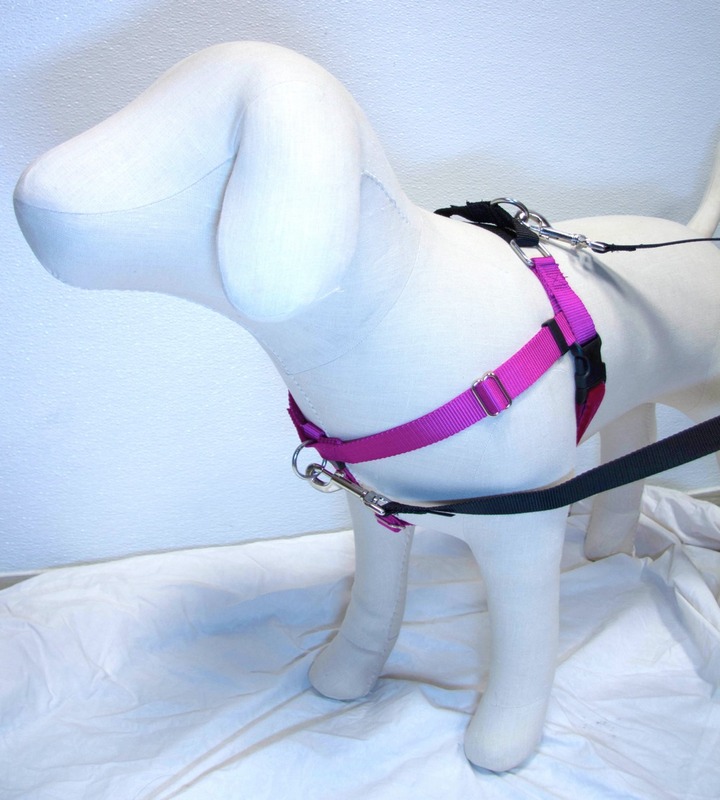 The 10-configuration leash is (1) color and will match the main color of the harness. For example, if you order a 1" wide red harness with black loop the leash will be 1" wide solid red unless you order the leash separately on the leash section of the website. Each harness is a solid color with contrasting colored loop on the back of the harness. 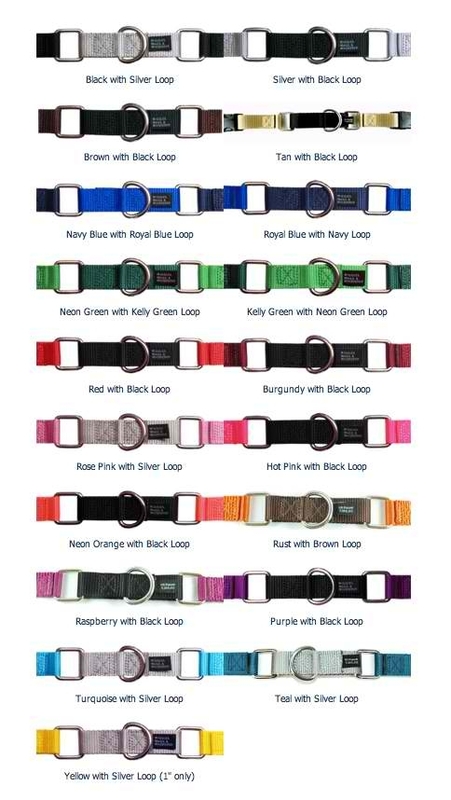 Not only is the contrasting loop fashionable but also functional as you can easily identify how to place the harness on your dog, the loop sits on the back of the dog at the base of their neck. When ordering either the 4-way training leash or the 10-configuration leash, you will receive a leash that matches the harness, unless you specify otherwise in the notes section when ordering. The Freedom No Pull Harnesses are in-stock and ready to ship. Priority orders ship within 24 business hours and Economy within 1 to 2 business days.. If you have a specific required shipping time frame please contact us PRIOR to ordering so we can check our stock. The products we offer are carefully constructed. However, as with any item placed on, near, or around an animal's body, there is a risk of entanglement and/or injury and should not be left on an unsupervised animal or used in tie-out. Although the products are constructed for safety, a well placed tooth or nail can cause immediate damage. This includes natural habits such as scratching and biting/chewing. Each of these natural habits can compromise the stitching/webbing and open/close buckles and can increase the risk of injury and/or escape. As teeth act like a razor chewing damage can happen quickly. Chewed webbing may have puncture marks but will more than likely look like slices, tears or rips as the doggies teeth act like razors. 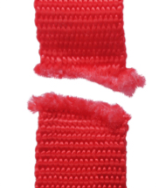 Check all products closely for chewed webbing and scratched seems before using with your dog. Good News!!! If your harness has become damaged you can have it repaired for FREE!!! The materials used are extremely strong and durable. However, considering dogs can easily bite through bones, chewing through webbing can also be accomplished. The webbing used for the harness and leashes are industrial grade, the same used to tow small vehicles and will not fray apart unless cut or chewed. Please reference the example picture above. If you find that your harness has become damaged in anyway, you can have up to (2) webbing straps on the harness replaced for the cost of shipping. Click here for the Chewing Warranty Page. Jessica MacDonald is the owner and inventor of the Freedom Harness. She is also the owner/partner of this site, USA Dog Shop, and the store located at Palisades Center Mall in West Nyack, NY. Jessica has been in the Pet Industry and has been working with people and their animals for over twelve years. She designed the patented harness after walking a friends large, 150 lb dog, Raven, who was dragging her down the street. Raven, a Rottweiler, was originally in a prong collar. The collar was not effective in controlling the dog because the force was only placing pressure on the neck and not controlling the strongest point of the dog at the center of gravity, i.e. the chest. After conceptionalizing the tensioning loop design, she sewed together a harness, put it on Raven, and found that the harness was extremely effective as a training tooling and minimizing the pulling. 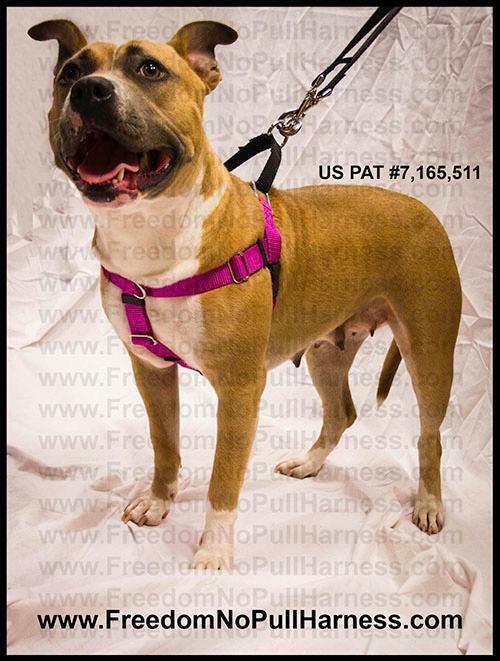 She then applied and received the US Patent on the Freedom No Pull Harness. Should you have any questions please call USA Dog Shop directly and Jessica or a team member will be happy to help you. "Prompt and courteous communication + really fast shipping = one happy customer (me)." "Quality construction – this thing is really well made""In short, I love this thing. Eight paws and two thumbs up"
"We have tried so many no-pull leashes with Paddington that I cannot even count. All of them claimed to be the best of the best and none of them worked....until now!!" "After trying out over a dozen makes and models of dog harnesses, a clear winner has emerged which fits the Harness Criteria for Hard-Core Pullers set out last week. The Top Pick overall is the No-Pull Harness from Wiggles Wags & Whiskers." Constructed of industrial strength nylon webbing, the FREEDOM No Pull Harness features solid stainless steel hardware, reinforced X- stitching and a comfort conscious design that keeps webbing edges turned out to prevent irritation. Additionally, this harness features a luxurious Swiss Velvet lined chest strap to inhibit chafing behind the front legs. Dimensions Please Note: The measurement is more important than the weight. The weight is only a guideline. 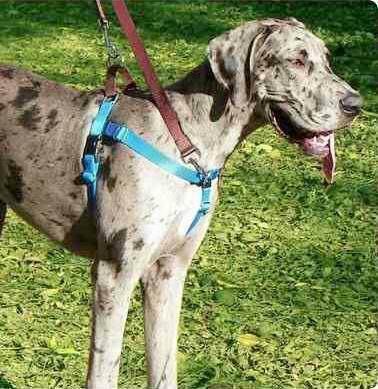 Custom Large Sizes: If your dog is greater than the 2X-large we can have the harness custom made for you. Selecting the Correct Harness Size: Measure the circumference of your dog's chest by placing the tape measure all the way around the girth (rib cage), behind the front legs. The tape measure should be flat to the dog, not pulled tight, but not loose. Select a size that is closest to the middle range of the harness. If your dog measures 26" and is an adult at a good weight, you will want the medium 22"-28" not the large 26" to 32". If your dog is 31 1/2" and is an adult at a good weight, you will want the X-large 30"-38" not the large 26" to 32". Selecting the size closest to the middle will allow maximum adjustability and comfort for you dog. If your dog is a puppy please email or call us so we can help you select a size that will fit your puppy now and as they grow bigger. LOVE! The color is beautiful, and the owners are so incredible. My harness came already adjusted to the proper size. Also, I was so anxious to get the harness, and it arrived so quickly. Thank you!